Ithaca College Heads to the Big Apple! 9/23/2012Share this story on Facebook! 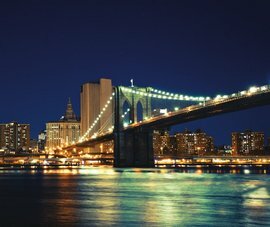 Learn more about IC's semester-long program in the Big Apple! New York City has always been a hub of international culture and commerce, and now Ithaca College students can experience the excitement while furthering their education. The semester-long ICNYC program is open to select majors from all five schools. It centers on a six-credit internship and coursework. Students take classroom-based and online courses, choosing from such titles as Commercial Law, Political Campaign Imagery, Government and Media, and Travel Writing. This fall 22 students are taking part in the program and are interning with Saturday Night Live, The Late Show with David Letterman, and Rolling Stone, among others. Andrew Steedman ’13, a business administration major, interned last spring at Madison Square Garden in the president’s office at MSG Sports. There he conducted research for the National Basketball Association and National Hockey League, and coordinated events for the president’s office. “For an upstate school to offer a program like this is amazing,” he says.